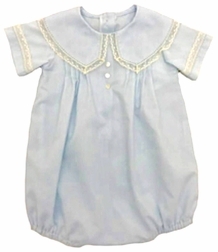 This is a darling bubble outfit for little boys for Easter, Christening, baptisms, portraits, weddings and other special occasions known as the Lane. The bubble is made with batiste fabric in white, ecru, light blue, soft yellow or mint green. 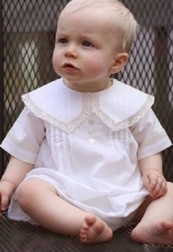 The bubble has a pointed Peter Pan collar trimmed with white or ecru French lace. The front is embellished with 3 little buttons in the center and pintucks on either side. The bubble is finished with French lace on the sleeves.